The people following the advice of the major guidebooks will place Rila Monastery and Plovdiv on the top of their list of must-visit sites in Bulgaria. You can book two separate day tours or go to this private tour, which has an itinerary flexible enough to suit your taste. Your private expert guide will be there for discussions along the road, will dose the information about the major sites according to your preferences and tireless help with your choices. In two days you can see and learn more about Bulgaria than other people in a week. 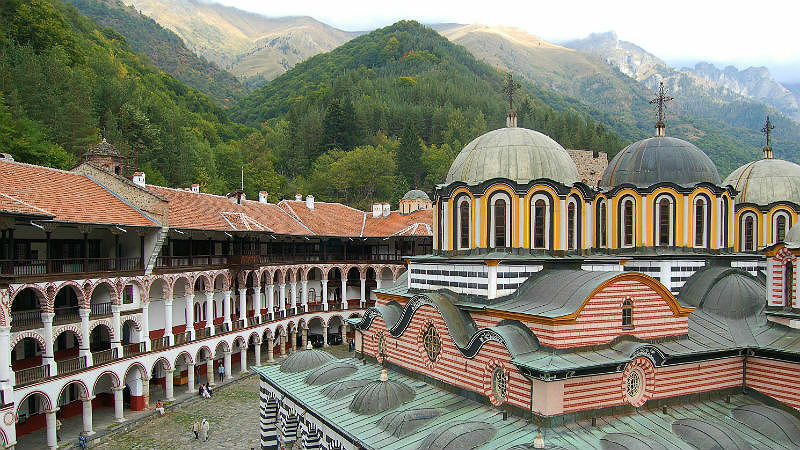 9:00 Pick-up from your hotel in Sofia and 2-hour transfer to Rila Monastery (UNESCO). Tour of the monastery with entry to its history museum. Have lunch and try local dishes at a restaurant recommended by your expert guide and then continue with the scenic drive along the foothills of Rila and Rhodopi Mountains to Plovdiv. Arrival in the late afternoon. The city standing on 7 hills by the river Maritsa has an exceptionally vibrant and joyful center worth exploring and enjoying. Overnight in a 3-star hotel in the center of Plovdiv. 9:00 The Old Town of Plovdiv is filled with pastel-colored Revival Period homes with flower boxes at their windows, picturesque cobbled streets and charming coffee and antique shops. Practically there you will see monuments from antiquity, medieval times, Ottoman and Bulgarian Renaissance and the communist period. Visits to the Revival Period museum-house, the Ethnographic museum-house, the Roman Theater are included. Lunch and free time for shopping. Transfer back to Sofia. Entrance tickets to Rila Monastery Museum, Plovdiv's Ethnographic and Revival Period Museum and to the Roman Theater and Stadium. The tour is not suitable for children under 4 years old.